Boring is an unincorporated community in Clackamas County, Oregon, United States. It is located along Oregon Route 212 in the foothills of the Cascade mountain range, approximately eight miles (13 km) south of Gresham and Clackamas, and approximately twelve miles (19 km) southeast of Portland. The Boring Lava Field, which lies between Portland and Boring, took its namesake after the town. 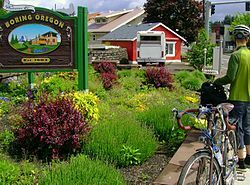 Named after William Harrison Boring, a former Union soldier and farmer who settled the area in 1874, Boring was officially platted as a railroad town in 1903 after the Portland Railway, Light and Power Company constructed a line to the area. The former railway is now part of the Springwater Corridor, a rail trail which begins in Boring and ends at the Eastbank Esplanade along the Willamette River in southeast Portland. After the town’s establishment, it became a major logging community prior to and during World War I due to the abundance of timber in the area. In addition to logging, plant nurseries and agriculture have also historically been major economic forces in the town. In 2012, the town was paired as a sister city to the town of Dull, Scotland, United Kingdom, and to Bland, New South Wales, Australia in 2013 due to their unusual names. According to the 2010 U.S. census, the town population was 7,726, in 2,875 households. This was a significant drop from the 2000 census, which had reported a population of 12,851. The current population density is 261 inhabitants per square mile (100.8/km2). Males make up 50.50% of the population, while females make up 49.50%. 90.65% of the town’s residents were white, 0.06% black, 2.43% Asian, 0.23% Native American, and 2.71% identified as “other.” 7.5% of the population identifies as Hispanic or Latino.As of 2010, the largest ancestry groups in the town are German (22.3%), English (14.0%), Irish (10.4%), and Swedish (5.5%). The median age in the town was 48.2, and 78% of households comprised a married couple living together. 29% of residents were college educated with a bachelor’s degree. According to 2012 data, the median household income in Boring is $73,208, while the per capita income is $28,438. 32.20% of households earned under $50,000 annually, while 39.80% earned between $50,000–$100,000. According to the Portland Business Journal, Boring is considered one of the wealthier zip codes in the Portland area.28% of the community’s annual household median incomes exceed $100,000. As of June 2016, the unemployment rate was 3.98%. 86.8% of residents are property owners, while 13.2% are renters. The town is served by the Oregon Trail School District, and is home to Naas Elementary School, Cottrell Elementary School, and Boring Middle School. Students’ test score performance in the public school system ranks above the national average. Private schools in the area include Good Shepherd School and Hoodview Junior Academy. The first schoolhouse built in Boring was the Fern Hill School, built in 1883. Later, a four-room school house called Oregonia was built in 1904. A 40-by-60-foot play shed was added to the school in 1918.